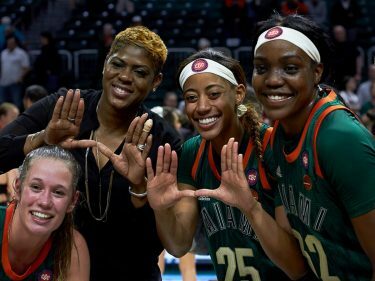 Following a thrilling double overtime victory at Boston College, Head Coach Jim Larrañaga’s University of Miami Hurricanes hope to keep its NCAA tournament hopes alive against the Virginia Tech Hokies 7 p.m. Wednesday at the BankUnited Center. Last week, Larrañaga said his team needs its rating percentage index (RPI) to be in the top 40 to make the NCAA tournament. The RPI is 64; however, if the team splits its remaining games against No. 12 Louisville and No. 15 North Carolina and wins its other remaining conference games, Miami may still make the Big Dance. The Hurricanes (16-9, 6-6 ACC) are facing a quicker than usual turnaround after the game at Boston College was delayed a day due to a snowstorm in the Boston area. Larrañaga’s team had just one day of practice to prepare for the Hokies. Wednesday’s matchup against Virginia Tech (10-15, 2-10) marks another hurdle for the Hurricanes. This year, VT has lost to Appalachian State, Northern Iowa and Radford. The Hokies have lost four of its last five, with the lone victory coming from fellow ACC bottom dweller Georgia Tech. Virginia Tech’s RPI is 220th in the nation. Yet, Miami has struggled against low quality ACC opponents, losing to Georgia Tech, Wake Forest and Florida State.